It is very important to make a note of the crops that you are happy with as you go along so that you remember what you like in the winter when it is time to seed order. The three stars in the garden for me so far are, Pea ‘Green Arrow’ the seed was from Natural Gardening Company, I will grow only this pea next year. The other two stars are both Lettuce, one is “Jericho, the seed is also from Natural Gardening Company and the other is ‘Devils tongue, this seed was from The real seed catalogue’ they are in Wales. The photo is of the L. ‘Devils tongue’. We have a line of Amaranthus in the ground again this year. I planted the seed just before I went off on my holiday and I have come back to it up and looking very good. The seed was sent to me from Jonny’s Mother who is part of an exchange with Mexico. This year we have three different varieties, two red and green. The seedlings are going to need thinning out, I will wait till they are a little bigger to do it so that I can eat them in salad. I need to find a better way of using the seed this autumn, I have time to look into it. Not everyone has a friend like I do, Lee Hallman. Lee made our trip so special and part of this was down to a book Lee had with her. I wanted to introduce you to this set of books that Lee finds to be useful. The title is ‘City Secrets’ edited by Robert Kahn. The books are also a very good size to carry around. Thank you Lee. Perry and Juliet for a great city break. 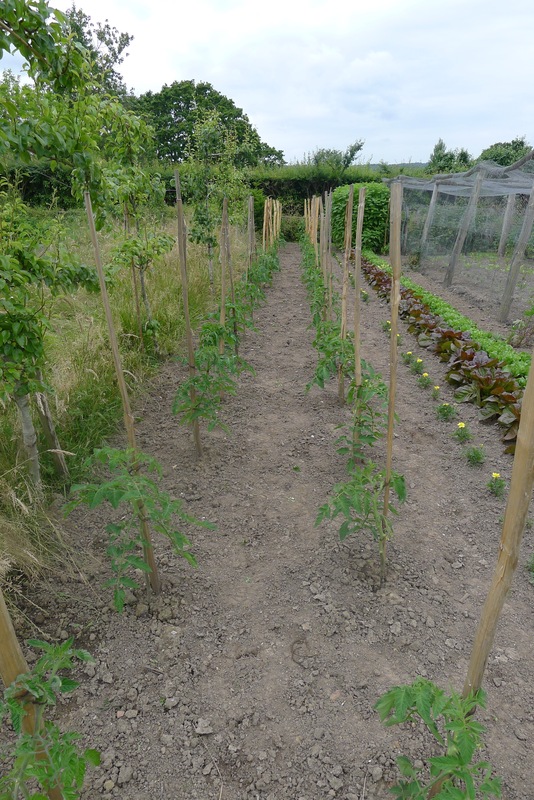 The Tomatoes have had the second tie on now. It is very important to keep them going up and supported at this stage will stop them bending. I have also taken off the lower leaves and all laterals so that the plants will put their growth into the flower shoots and the top growth. I will let the plants get to about five foot tall at that point the top growth will be taken off. We will also keep the lower leaves off so that there is a big gap between the growth and the soil. The plants need good light on the flower shoots. It is always great to get home and to be in ones own bed again, and of course to see my two little dogs who did seem happy to see me but looked very well and cared for by Simon and Adele. I had a good look in the garden when I got home and things looked great, Matt and Ellie did a great job of keeping on top of things. 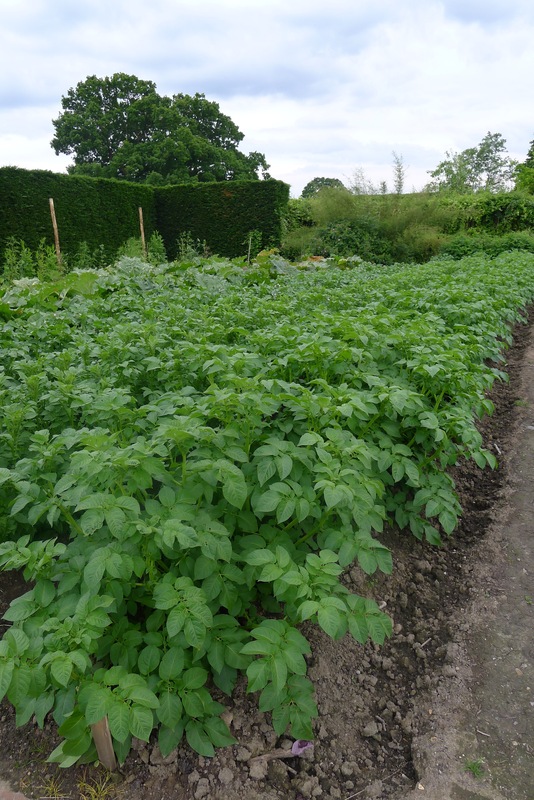 It does seem that the crop that had grown most are the potatoes, they are so tall now. There may be some P. ‘Charlotte’s’ ready to eat and with a symposium next week here it will be perfect. Happy Birthday to my Mother, she would be 61 today. The last day in Rome was very special, we booked a ticket to go in the Vatican Museum first thing and I have to say it was the best way to see it without all those people that you get later. What a place the Sistine Chapel is, the whole thing is hard to put into words, a must see. After the Chapel we enjoyed the Museum, once again Lee lead us on this. We also went out into the heat, 41 today to look at the Colosseum. The last thing on the city tour was a very interesting Chapel that is so old but also two floors underground, it was a good place to get out of the heat. Now going for a local meal. There is something very romantic about the whole of Italy, I think there is something in the olive oil, I have had as much as I can. I had always said that I would not come to Rome till I was in love and since I do not think it is going to happen I am so happy to be here and today to go and see one of the most romantic gardens in the world, Ninfa was a dream come true. It is the perfect mix of Medieval and Roman. One of the most important and special things is the water running through the garden, it gives such a special movement to it as I whole. The buildings have just the right amount of growth on them. It is one of the hardest things so do, control in a way that it does not look controlled.